Diana Rattray. The Spruce Eats, 2008. 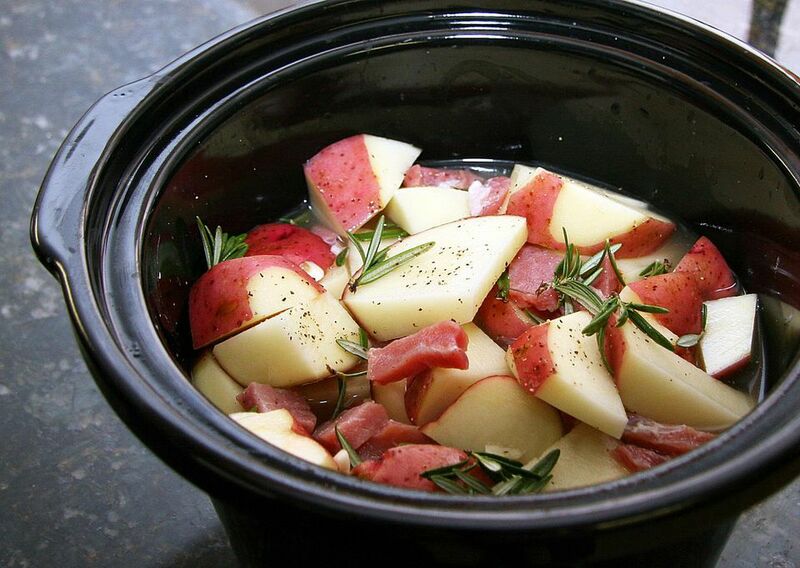 The slow cooker is a tasty, fuss-free way to cook potatoes, and fresh rosemary makes the dish extra-special. Sliced garlic and chicken broth add to the flavor as well. Using the slow cooker makes it especially convenient when the oven and stovetop are being used for other items. Serve these easy slow cooker potatoes along with roasted beef or pork or skillet chicken or meat dish. Feel free to use thyme instead of rosemary, or use a combination of herbs. Peel the potatoes, if desired, and cut them into 2-inch chunks. Layer the potatoes with the country ham, rosemary leaves, and sliced garlic, sprinkling each layer with a little salt and pepper. Tuck a bay leaf among the potatoes, then pour chicken broth over all. Dot with butter and cook on HIGH for 5 to 6 hours, until potatoes are tender. Discard bay leaf and spoon into a serving bowl.